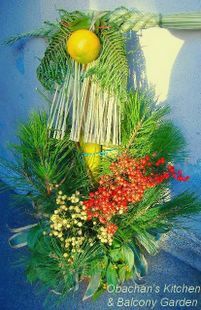 Obachan's Kitchen & Balcony Garden: Happy New Year! A belated Happy New Year Obachan! This Osechi looks very beautiful and harmonious, waow!!! you've done well last year with your blog. please keep it up! i'm looking forward to more posts from your kitchen! I hope you’re feeling better now. Just remember, that’s a good luck sign for you. Have a wonderful New Year to you! happy New Year and may 2006 bring you only goodness. Your Blog is very very inspiring, please keep it up. Happy new year again !!!!!!! お帰りなさい! This may sound selfish, but I was so eagerly looking forward to your coming back and hearing all the interesting stories (and food) you will be telling us. Wouldn't you agree? また, 明けましておめでとうございます. 本年もどうぞよろしくお願い申し上げます. We went to a local jinjya near Seattle to participate in Hatsumode, including observing O-Harae... Hiromi made a lot of Osechi foods, since we don't have quite the same depachika options here, and she wanted to give it a try. The results were very nice. Anyway, best wishes for the new year, and here's to all of us making lots of good food this year! Happy New Year! I liked most of the things in osechi this year, but there was one BIG mistake. I’ll post about it soon. Oh, I’ll tell my parents. They still have a lot left at their house and they’d appreciate it very much if you could finish all the leftovers. Uh…sorry, the top photo is not what I brought back from parents’ place. The photo is showing one of the “official” osechi dishes we had there. And there are more photos to come ;) Enjoy! Yeah, a lot better now. Thanks. Hello and thank you for dropping by. Best wishes for 2006! OMG, you work at a restaurant, too? So glad to find someone to share my misery --- and laughter, too --- in that kind of work environment with. Hope you didn’t get hurt too much. Don’t worry about the recipe. It can wait ;) Take care! How are you doing Obachan? Happy New Year and hugs from Panama! Happy New Year! My leg still hurts, but I’ll be OK soon. What a scrumptious project you did! I’ll come to your blog before midnight. Thanks! Yes, the fruit is "daidai" orange.